The IRHA Blue Schools Plus programme is specially tailored for mountainous regions. It changes the entire water, hygiene and sanitation conditions in schools, but also targets the local population living in a very difficult geographical and economical context. The project took place in four schools located in the Kaski district of Nepal. They either had no access to water and sanitation, or it was insufficient. The IRHA project transformed the above situation. 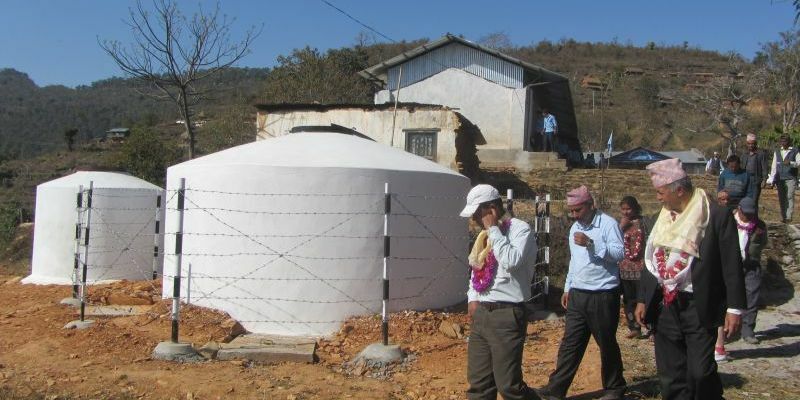 It constructed and repaired sufficient Rainwater Harvesting Systems and sanitation facilities to provide effective access to water, sanitation and hygiene to the entire school populations (1,113 individuals). It worked on changing water management, sanitation and hygiene behaviors at the local community level -and with all segments of society. The continuous awareness raising campaigns were conducted by our two social mobilizers who lived at the selected locations for over a year. This also helped create community ownership of the project. Other activities conducted also had an immediate response and further engaged local residents. These included a reforestation action, with fruit trees that in some years will turn previously barren school premises into orchards; building volleyball courts to help children put in practice gender equity, fair play and team work; constructing greenhouses/polyhouses and establishing communal vegetable gardens and multiple training sessions on income generating activities for the poorest and most vulnerable sectors of society.